You may have a love/hate relationship with the stuff as much as I do, but my kiddos sure can’t get enough of it. 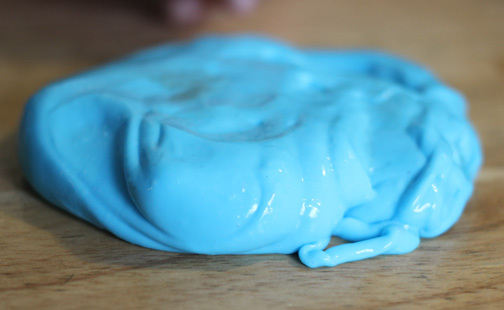 Flarp… Gak… Slime… So we made some and even explored some of the science behind it! 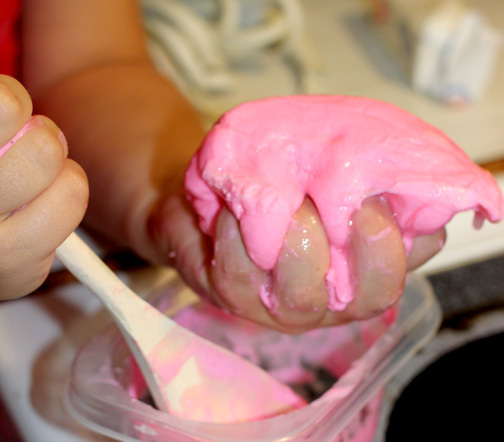 There are few things that get the tactile (touch) senses going more than the feel of slime and as a therapist, I loved to pull this recipe out and explore with kiddos who have a hard time touching different things. If you really want to see a group of 9 year old boys have a great time… nothing more fun that the continual sound of farting! Borax Cleaning Agent (crystals found in the clothing detergent aisle)- more about this later! Pour about half of a bottle glue into your mixing bowl. You can use the whole bottle if you would like a large amount. Fill the bottle with water and shakie shakie to get the remaining glue out of the bottle and pour into the bowl (or divide, if you divided 🙂 ). Add food coloring *** Set aside. 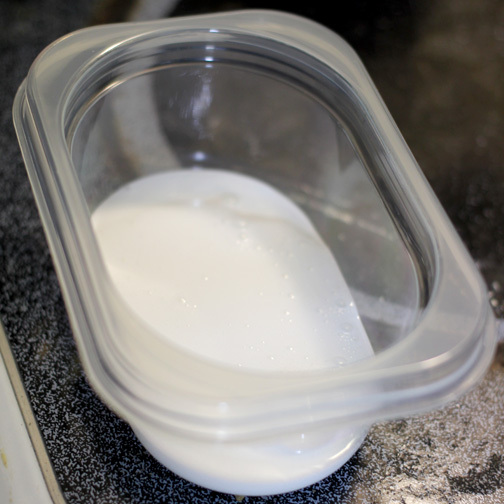 In a separate bowl, combine approximately 1/2 cup water with 2 teaspoons of borax. Mix well. Using warm water helps to dissolve the crystals more easily. 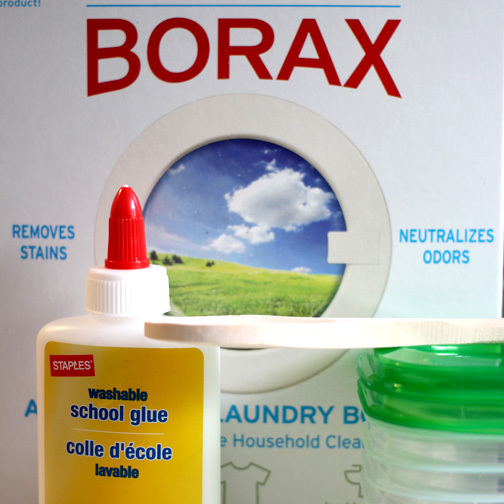 Using your teaspoon, add a small amount of the borax solution to the glue solution and mix. Add a small bit at a time until you get the desired consistency. You will want to get your hands on it when it is starting to look ready to see if it has the desired feel and stretch. Adding too much borax solution makes the slime a bit hard! If you do make it hard, re-add some glue solution. One of the really cool things about this slime is that it is what my kiddos like to call a lolsquid- its a seemingly liquid solid. What we discovered recently at Imagine RIT is that its technical term is a non-Newtonian fluid. WHAT! Basically, as you add pressure to the slime, its molecules are able to stick onto themselves. When you release the pressure, the molecules move back apart to their regular state. Liquid… solid… liquid… solid… Cool right?! Science Fair project anyone? Anyone? Beuller? But I digress. When I would make this regularly as an OT, I avoided making it with my kiddos who liked to put things in their mouths. Since then, I have seen borax around as a “natural” cleaning product, so I went exploring more. Crunchy Betty wrote a great article on it and provided some insights that eased my mind a bit in her article. Long story short, Borax is made of a salt. It is NOT boric acid. It appears to be harmful when ingested in large amounts, just like table salt. That being said, I am less averse to having kids touch and play and simply wash their hands afterward. As with anything, this slime is not meant to be ingested and play should be done responsibly. You of course are the best judge of whether this project is right for you and your kiddos! If you like, you can substitute epsom salts or even try sea salt at a higher concentration as well. I haven’t tried those and would love to know if you do! In addition to substituting the salts, you might also want to substitute the water you mix into your glue with florescent water. With about 1/4 cup of water, allow a florescent highlighter or marker to discharge its ink into the water. Use this water to mix in your borax or wash out your glue container. No need for food dye! Gonna have to give that a try… I am thinking it might look really radioactive! Hope you have fun with this super slimey project. Thanks for reading!!! Good lord that’s a new thought – was that a sudden rush of excitement I just felt …….. So, I know the highlighter will only glow under a black light. I do not have a black light, so I was wondering if I could use glow in the dark paint. Would it change chemical reaction in any way? I do not want to waste the ingredients because i want to make a HUGE batch for my students, but I Cant waste the little amount of ingredients I have by experimenting. Please reply, thanks!! use tonic water, and clear glue you get a cool looking gel that glows under a black light and has bubbles for a while, but the bubbles go away with lots of play. Awesome! Will have to try that!! !